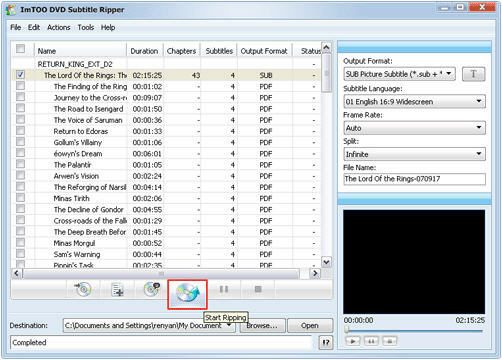 On the main interface, click the "Open DVD" button to add DVD-Video disc or DVD-Video folder into the file list. In addition, by "File>Open DVD... " option, you are also able to add DVD-Video. Meanwhile, you can also add VOB, IDX+SUB file by clicking the "Add Files" button, or choosing the "Add..." option on the "File" menu. Tip: The files including subtitles in the file list will be checked as default. If you add DVD-Video or VOB file, the main movie title will be checked. If you add IDX+SUB file, the file will be checked. If you only wish to rip the subtitle of certain portion of the added files, you can re-check the files. Set the path to save the output files. To do this, click "Browse..." button and select the required folder in the dialogue box that appears. In the "Output Format " drop-down list, select a required output format. Select the required output language in the "Subtitle Language" drop-down list on the right main interface. Tip: The drop-down list includes all the language files originated from the added files, where you can select the language you intend to rip. In addition, two more options, "All" and "Customize..." are also for your choice. Set the required frame rate of the output file in the "Frame Rate" drop-down list on the right main interface. In the same way, you can set splitting mode in the "Split" drop-down list. Tip: The "Frame Rate " option, the "Split" option will be available only in the case that the "Output Format" is *.SUB. The software supports to rename the output file. To do this, enter a new name for the output file into the "File Name" edit box. Tip: The software will keep its original name for the output if it is not renamed in this box. Click the "Start Ripping" button on the main interface to start the ripping of the files checked in the file list. Tip: During the conversion, you can monitor the conversion progress which will be shown in the "Status" column in the file list.